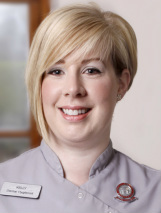 Kelly Teburi is our hygienist and she plays a vital role in caring for our patients. We screen our patients for signs of gum disease and Kelly helps treat this with a variety of techniques. As well as carefully scaling and polishing, Kelly helps patients with their oral hygiene, ensuring they have the correct brushes and other products that we have in stock. We recall all our adult patients regularly to see Kelly to ensure optimal gum health.